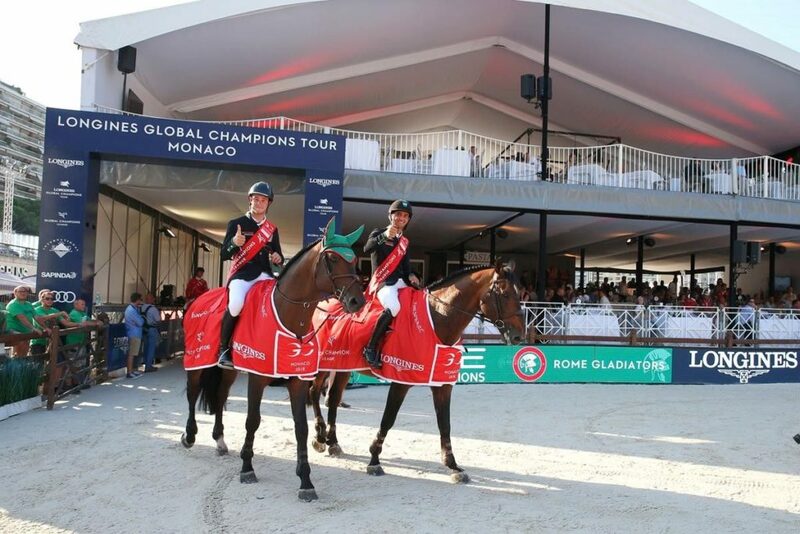 Constant Van Paesschen and Marlon Zanotelli of the Rome Gladiators made a meteoric rise up the overall GCL rankings today in Monaco, after the duo secured their first victory of the season in one of the most compact and challenging arenas on the circuit. With their spectacular win today, the Gladiators now sit third in the overall Championship race, with a points tally of 137. Another strong result from London Knights’ team of Ben Maher and Martin Fuchs kept the team in the overall lead with 199 points, with Valkenswaard United’s Alberto Zorzi and Bertram Allen just holding on to second with 183 points in total. Frank Rothenberger produced a tight and technical course, with athletes racing up and down the arena and a tight time allowed of 69 seconds. The design was challenging from the start, with a vertical out of the first corner requiring instant focus and commitment. Other challenges were posed by a gappy Sapinda vertical, an imposing black and white Massimo Dutti oxer, with a Longines treble set along the diagonal of the arena off a turn, requiring plenty of smoothness and balance and a double put close to the longside where spectators watched on. Featuring a plank in, a big oxer in the middle, and a plank out, the Longines treble fell time and time again, particularly the first plank if the rider didn’t quite master the turn. The course suited sharp and intelligent horses, those who were most responsive to their riders and able to change direction and pace in a heartbeat. There was huge disappointment for the Shanghai Swans after Pedro Veniss and For Felicia ducked out at the first fence, before taking out the treble and collecting 19 faults for the team before teammate Pius Schwizer took over the reins. But the Swans sunk further still after Schwizer rolled a pole, adding yet more faults to their tally. Home city team Monaco Aces also had a shock exit after Simon Delestre and Filou Carlo Zimequest collected an unusual 12 faults, despite a brilliant clear from teammate Julien Epaillard and Quedge Deenne. Doha Fursan Qatar were followed by Edwina Tops-Alexander and Pieter Devos of the St. Tropez Pirates who put in a team clear, keeping the squad on a score of four. Valkenswaard United needed a strong result today to try close the gap to ranking leaders London Knights. First to go Alberto Zorzi and Fair Light van T Heike pulled out a spectacular clear, before further drama unfolded as Bertram Allen and the 10 year old Izzy by Picobello lost a shoe in the warm up. This meant they couldn’t jump after their teammate, and slotted in after London Knights, with anticipation mounting for the 2016 Championship winning team. Overall leaders London Knights pulled out a stunning team round after Martin Fuchs with Chica B Z and Ben Maher with Winning Good all jumped cleanly to finish on the four faults and extending their lead ahead of the rest of the pack. Bertram Allen of Valkenswaard United returned to the ring, clearly unfazed by Izzy by Picobello’s earlier loss of shoe. The team needed a clear, but it wasn’t to be after one pole fell, meaning London Knights would increase their ranking lead over United. First of those on a clean score Montreal Diamonds had disappointment after Harrie Smolders’ Cas dropped a leg in the double to put the team on a score of 4, slower than the Knights despite a strong clear from Mark McAuley and Miebello. Prague Lions fielded U25 rider Anna Kellnerova first, and there was heartbreak as the final fence – the Monte-Carlo Casino vertical – fell. Another two from Gerco Schroder and Glock’s London saw the team plummet down the order and out of podium contention. Constant van Paesschen pulled out a phenomenal clear for the Rome Gladiators with the enthusiastic stallion Jilbert van ‘ T Ruytershof, managing his horse brilliantly to leave the team on a zero score. Anchor Marlon Zanotelli put in a breathtaking performance with Rock’n Roll Semilly, keeping the Gladiators as the only team on a completely clear score. Four faults apiece from Scandinavian Vikings’ Leopold van Asten and Geir Gulliksen dropped them down the order, and all eyes turned to New York Empire, the only team between the Gladiators and the win. First to go Scott Brash rode Hello Mr President beautifully, but their hopes of victory fell as a pole was touched, meaning Gladiators would reign supreme. Another two poles for David Will with Deluxe Ilton dropped the team off the podium, and out of contention for a big points haul. So victory would go to the Rome Gladiators who shoot up to third in the overall rankings, just behind Valkenswaard United and London Knights.